This is the Echo MK II guitar, it differentiates from the MK I in our range by having a more modern, dynamic look as opposed to the traditional look of the MK I. The bottom of the guitar has been made rounded whereas the original was flat and the waist has been decreased, these both give the guitar a more curvy shape. The bottom horn has also been re shaped to give a slightly more aggressive look. So it might look like a familiar design, but in actuality very few lines remain the same. The guitar pictured here is a break from our usual Echo MKII as it features a True Temperament neck. Having previously worked with True Temperament we jumped at the possibility to have a True Temperament guitar in our range as a permanent addition. The system offers perfect intonation at every fret and seemingly endless sustain. For more information on the True Temperament system, please see www.truetemperament.com. We decided on the Echo MKII body shape to pair the neck with as it is harmonious with the headstock shape. We wanted a modern theme with this one, something which would be at home playing anything from classic rock to metal. So we chose the Seymour Duncan Quarter Pound pickup set which offers plenty of high gain tones while still being manageable and possible to obtain more traditional tones. 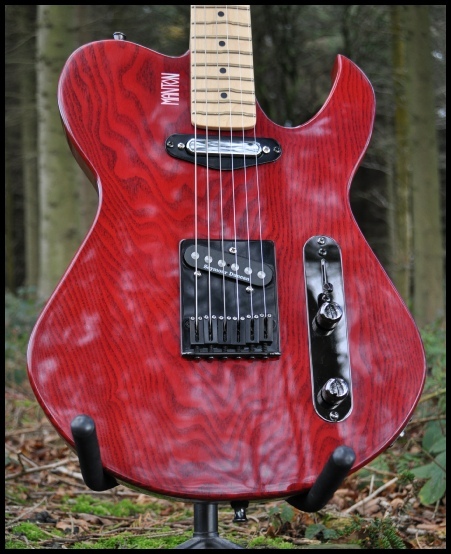 For hardware we chose a modern 6 saddle Gotoh bridge and Gotoh machineheads, both finished in black to contrast nicely with the blood red finish and blend with the beautiful black grain filled one piece Ash body.